Subheadings: The Science of Vibration Divination by Numbers Divination by Cards Spiritual Science After-Death Survival Origin of the Tarot Cards Tarot Correspondences Origin of the Suits Making the Spread Yes or No? IT HAS BEEN said by that eminent kabbalist, Eliphas Levi, that four signs express the absolute, and in turn are explained by a fifth. And we find this very true, both as applied to astrology and to the tarot. In each, the fifth term, by which the four fundamental elements are explained, is the language of universal symbolism. Therefore, the student may expect, in his study of the wide range of symbols employed in the tarot, to be made thoroughly conversant with a language which has been employed by learned men in all ages and all climes to impart the most profound truths, a language which, because of its wide appeal does not essentially vary with the passage of time, which is imperishable, and can be read by the intelligent members of any race. The tarot is the ONE standard text-book on the meaning of universal symbols. Now these four signs, which are explained by universal symbolism, as applied to the Grand Man of the universe, are represented by the four quadrants of the heavens. These, in turn, of course, correspond in function to the four letters of the Deific Word, Jod-He-Vau-He. And because the sacred tarot pictures and explains this Grand Man from the feminine, or esoteric standpoint, it also has, in addition to being a text-book of the most ancient of languages, four distinct functions to perform. Therefore, even before explaining the source from which the sacred tarot is derived, I feel that these four distinct and important functions should be set forth, and that those who teach this Hermetic System should insist that their students should at all times keep these four functions in separate compartments of their minds, without confusing one with another; for each is a distinct and clear-cut system in itself. Two of these systems—as must be true if they correspond to the Divine Jod-He-Vau-He—are positive. They are really sciences. And the other two are feminine and negative. They are systems of divination, each accurately corresponding to one of the four corners of the universe. Corresponding to the Leo quarter of the zodiac there is a Science of Vibration, to which numbers furnish the key. Corresponding to the Scorpio section of the firmament there is a system of Divination by means of Cards. Corresponding to the Taurus quadrant of the sky there is a system of Numerology, or Divination by means of Numbers. And Corresponding to the Aquarius region of the heavens there is a Spiritual Science, which forms the basis of a complete philosophy of life. Right here it should be emphasized, so that later no confusion may arise, that the Hermetic System of Vibration as determined through using numbers is quite unrelated to any system of numerology. Numerology, new systems of which are being devised each year, is a method of divination. And as divination by numbers is one of the four functions of the tarot, nothing here is said in disparagement of numerology. In fact, I set forth such a system in chapter 8 of this course. But the vibratory science here explained, although dependent upon numbers for the determination of effects, is not numerology. It is a positive science, as precise in its results, and as independent of psychic matters, as any physical science. Through it, as the physicist determines by means of numbers the vibratory frequency of different colors, or as by means of numbers he determines the vibratory frequency of any selected musical tone, so also by means of numbers, can the vibratory key of any thought be determined. The great Caruso, in demonstrating the power of his voice, also well illustrated the importance of the vibratory key. When he went into a café, at times he would call for a wine glass. Tapping the glass to get the key, he would request the waiter to place the glass on a table in a distant part of the room. And then, by singing the tone to which he had found the glass keyed, by the powerful vibrations of his voice reaching it across the room, the glass would be shattered. Thoughts, like vocal tones, are vibratory rates; but they are definite vibrations in astral substance. Nevertheless, like Caruso’s voice, they have the power to travel across space and bring about physical changes. And like his voice, also, it is their vibratory key, as well as their volume which determines their effect. The key to which thoughts are tuned often can be determined by their subject matter. But other thoughts, which also have powerful vibratory rates, are abstract in quality. That is, they merely designate some thing or quality. Such are names, and such are numbers. It is not the physical sound of a name or a number that is its potent influence; it is the thought-vibration of the one thinking it, which radiates outward from his mind to the person or thing thought about. This vibration reaching a person thought about influences him according to the key of the thought. Different names and different numbers vibrate in different keys. Different vibratory keys produce different effects upon the objects or persons they contact, even as do different sounds. And, wholly apart from any process of divination, it is the object of the Science of Vibration as set forth in these studies to determine the key to which names and numbers vibrate, and how they affect the things and people with which they become associated. Because, as I have already pointed out, there are an increasing number of methods of using numbers in divination, little need be said about this phase of the subject here other than to point out that all these systems of Numerology, as well as the Hermetic System of Divination by Numbers, are really methods of divination. As such they possess a legitimate function. Many of them other than the Hermetic System give quite accurate results. But in no case should they be considered as a Science of Vibration; for such a science is based upon the observed effect of thought vibratory-rates, and is something entirely apart from any kind of divination. Nor is any system of laying out the cards strictly a scientific and positive process. Like numerology, the methods of card reading set forth in this Hermetic System, as well as all other card-reading methods, are useful; but they essentially are systems of divination. Now, however, when we come to that function which sets forth a spiritual science as a basis for a complete philosophy of life, we are again back on positive and scientific footing. It is true that in perfecting this science there is recourse to the law of correspondences. Nevertheless, the philosophy of life derived from this science is based upon the strict observation, by those throughout the past ages who were most competent to ascertain them by experimental methods, of spiritual facts. Every noteworthy spiritual fact that has been uncovered by the researches of the most exalted minds since the world began, and checked as to accuracy by subsequent illuminated ones, is set forth in the language of universal symbolism in the sacred tarot. That is why we who delve deeply into it call it Sacred. But while the spiritual facts are thus clearly set forth, except for certain guiding lines each is left free to draw from them such conclusions as his state of evolvement will permit. The facts are there, but to us is given the task of giving them an adequate detailed interpretation. But after all, of what particular use is a spiritual philosophy? Because the vibrations of people thinking our name, or our telephone number, reach us and conduce, through stimulating harmonious or inharmonious conditions within ourselves, to our health and happiness, or to our failure and misery, it is easy to see that a science of vibration which enables us to regulate such matters is important. And, in so far as divination gives us valuable and reliable information, it is not difficult to understand the prevalent interest in numerology and in card reading. But of what value is a spiritual science, or the philosophy derived from it? Well, to give a proper perspective to this one of the four chief functions of the tarot, we must make a brief examination of life in general, and of man in particular. Man, for instance, like all other living entities, possesses a strong desire to live. But the life of any organism continues only so long as it makes successful adaptation to its environment. Part of man’s environment consists of countless other forms of life, toward which it is essential he should observe a proper code of conduct. He must obey the impulse of the moment seldom, but instead, consider the effect of his action as influencing his future welfare. Especially is it important that he shall conduct himself properly toward others of his kind, otherwise conflict, or wanton depletion of food supplies, may cause all to perish. His chances of survival are greatly heightened when he can obtain, not the antagonism, but the cooperation, of some of his fellows. Such cooperation, however, is only made possible by an understanding as to mutual aims. When such mutual aims have been established a single tribe becomes better equipped to attain them than any individual, and a nation becomes superior to a tribe. Yet members of any cooperative group who have variant aims weaken the effectiveness of the whole. Thus for mutual advantages, and to prevent disaster befalling, there must come to be a recognized standard of conduct. Such a code has for purpose those actions which will confer the greatest advantages on the whole group, and thus also confer them upon the individual members. And the advantages striven for are determined by the knowledge of the people. But whether those prescribed in the standard of conduct actually contribute to the welfare of the group or not, and to what extent, depends entirely upon how correctly they have interpreted the true relation of one life-form to another, and the true relation of the individual to the group. This interpretation, because actions are based upon it, is the most dominant factor in shaping the lives of a people. It is called their ethical standard. Now in national life those things are advocated which are believed to add to the richness of people’s lives, and those things considered destructive are prohibited. Yet people have not found a means by which physical dissolution can be postponed more than a few short years. Not being able to make the continuous adaptation to a physical environment which would enable them to continue living upon earth, it was quite natural that some should investigate the possibility of a life in a region after physical death. And our foremost scientific men, by means of careful experiments, have confirmed their findings that man does live beyond the tomb. Yet wherever life is found, its survival and the fullness of its existence depend upon successful adaptation to environment. This same law must apply to the after-life of man. That is, to the extent he is able to make perfect and continuous adaptations in that future realm, will his life there prove satisfactory. Furthermore, as he has found knowledge to be the most essential factor in his adaptation on earth, he has a right to assume that the more knowledge he has concerning the conditions to be encountered, and about how difficulties are to be met and overcome, the better he will get along in the life after physical death. Many as yet are content with mere surmise as to the conditions that there obtain. And all through the dark ages man was content merely to surmise how matter behaved under different circumstances. Yet the progress man has made in material ways, the attainment of numerous comforts, and all of what we call modern civilization, was brought about by those who were not content with surmise, but who set about gathering accurate knowledge about physical things. Furthermore, ancient ruins give testimony of considerable scientific achievement even before history began. We have surpassed the ancients in these matters, it is true, and we may be able to surpass them in that other field to which tradition and ruins alike bear testimony, that is, in the field of spiritual science. But if we are able to do so we must discard surmise and substitute accurately observed phenomena. Upon the accuracy of the Chaldeans in calculating certain celestial phenomena, modern astronomers are forced to place considerable reliance, and to base some of their own findings. And as to the knowledge of astrology these same Chaldeans possessed, anyone who will take the pains to learn to erect a birth-chart can soon prove to himself that they had accurate knowledge which is scoffed at by the abysmal ignorance of parrot-taught scholars. Instead of taking the rules laid down by the ancients, and testing them by the approved methods of experimental science, conventional intolerance does battle with them by appealing to prejudice. And the same dogmatic assertions are used to discredit and block the path of anyone who makes a candid investigation of spiritual science. It is true that mystical folly runs rampant under the guise of occultism; but for that matter less than three centuries ago material science was no less a medley of confused notions and dogmatic opinions. And it became necessary, in order to build a sound structure for material science, to discard all that had gone before, and build on the solid foundation of observed facts. Upon such an unyielding foundation the framework of scientific thought has been reared, each timber being fitted to its proper place by the methods of deductive thought. And so erected, it constitutes a shelter which protects man from a thousand and one dangers which threaten his physical survival. But it has been unable to prolong the physical life indefinitely, and man as of yore, looks beyond the earth-plane to another existence after the tomb. About this after-life much is said, but little is commonly known. Yet all seem to agree that some kind of preparation for the new condition is necessary, or at least desirable. That is, they feel that as effort is necessary to enable one to adapt himself to physical life, some kind of effort must be necessary to make successful adaptation to any life in the future. But men do not agree of what this preparation should consist. The very yearning of the human soul, therefore, demands that there shall come into existence a spiritual science, a science which shall inform man definitely about the life he will be called upon to live after he leaves the physical plane; and that will direct him as to the preparations which should be made, while still on the physical plane, that will enable him the more successfully to adapt himself in the realms of the future. Thus do the necessities of man demand a spiritual science. But such a spiritual science can be soundly constructed only on the plan which so successfully has been used in the construction of material science. Notions must be cleared away, surmise must be swept to one side, and a foundation laid of indisputable facts quarried from the lode of critically observed phenomena. Then upon this foundation a framework should be erected according to the strictest methods of logic. And if the work thus done has been thorough there should result a shelter which is effective in protecting us from the inclemencies encountered in any life on any plane. In gathering this information for the foundation, we can use the reports of the physical senses somewhat; because they have been found to give rather accurate information as checked by practical affairs. But they also, at times, have been found unreliable; and thus they should be checked by those other senses, the senses of the astral, the psychic senses. These psychic senses also, in so far as practical experience proves them to be accurate, should be used to gather information. But because they also sometimes report falsely, their findings should be checked as to accuracy by the physical senses. Information should be quarried wherever it can be found, and by whatever method can be used; but before entering into the foundation of a spiritual science it should be tested by every known means. Now as to these psychic senses, about which some people may be skeptical, bear in mind that because a man can not track a hare by scent does not imply that a hound can not do so. And because many hounds fail to follow some particularly cold trail does not prove that some other hound may not be able to do so. The limits of one hound’s ability is not the measure of the ability of another hound, and whether a particular man can do something that another man can not should not be made a matter of surmise, but subjected to experimental proof. And thus in the application of the psychic senses; just how reliable their reports are must be experimentally determined for each individual, by subjecting their reports to subsequent proof. Yet when used judiciously, and in conjunction with his physical senses and common sense, they are found to be extraordinarily valuable aids to spiritual knowledge. In using the physical senses to gather material to be included in the foundation of a spiritual science, we find that there is a sympathetic relation between objects and events upon the earth and the heavenly bodies and their movements. No psychic faculties are needed to prove this, as it comes directly under the methods of physical experiment. Yet the science of astrology, which sets forth in mathematical terms, the relation of the heavenly bodies to things on earth, has mostly been handed down to us from the ancient magi. Not that we merely accept what they have stated; but, using statistical methods upon observed results, we have found their statements and interpretations amazingly accurate. The same magi specialized, generation after generation, for thousands of years, in just two things: they specialized in astrology, and they specialized in gaining information concerning the soul of man. In the acquisition of information on these two subjects they developed their psychic senses to a high degree, and they kept laborious records of experiments, day after day, year after year, generation after generation. And, in so much as the vast amount of information which has come down to us from them concerning astrology has been proved by experimental methods and modern research to be highly accurate, we are justified, I think, in placing some confidence in their findings where their other specialty is concerned. All the more so, because they linked their spiritual findings to astrology. Astrology, to them, was not merely character-reading, and a means of predicting events. It was also the science of the soul and the key to all spiritual possibilities. It had an exoteric side, which was applicable to the physical affairs of life; but it also had a more important esoteric side, which revealed the nature of the soul and to what conditions it would be subjected in the future. Thus these men of an olden day formulated just such a spiritual science as that for which we search. They scanned the universe with highly trained psychic vision, they checked the information gained in one manner by information gained in another manner; and when, as time went by, they became convinced they had some spiritual treasure, by means of correspondence, which they understood so well, they traced this spiritual fact as a constellation in the sky. Still further applying this principle of correspondences, they attached each to a number, so that spiritual ideas might be combined and handled mathematically, even as by means of numbers we solve the more humble problem of the family budget. And that they might thus be handled with facility, even as in algebra we use x, y, z, to represent more complex things, they used symbols to represent the spiritual verities that were being considered. For convenience in handling, these symbols, which stood for definite spiritual ideas, were engraved on plates. And thus it came about that each plate contained, in the language of universal symbolism, the explanation of some important spiritual fact. It explained in more detail than the pictured constellation or the symbol of the planet, just what these men of old had discovered. It was an esoteric interpretation of the spiritual truths associated with some planet or zodiacal sign. And attached to the plate was its corresponding number, so that through combining numbers having the same value as definite spiritual ideas, spiritual ideas could be handled mathematically. By combining their numerical equivalents a number could be thus obtained which would represent the correct resulting spiritual idea. Now, of course, we should not accept the spiritual findings of these ancients until they have been subjected to rigorous tests. We should not accept the findings of either moderns or ancients as conclusive. But because in those things where rigid tests have been applied these men of old have proved to have had such amazingly accurate and comprehensive knowledge, if we were to overlook their work it would, no doubt, make our own research far more laborious. Let us approach the spiritual ideas they have left us, not as conclusively proved, but in the same manner as we approached exoteric astrology. Let us take them, one at a time, and subject them to proof. And if the knowledge they left us concerning spiritual things compares in accuracy with the knowledge they left us concerning astrology, our labors in establishing a true spiritual science will surely be lightened. Those plates upon which, in the language of universal symbolism, the ancients inscribed their knowledge of spiritual things and the attainments possible to the human soul, were called by the Egyptians, The Royal Path of Life. In Egyptian, Tar means path, and Ro means royal, and thus, even at this day, the plates are known to us as the tarot. As a part of the mysteries divulged to candidates only after passing hazardous trials and hardships, they have largely remained the property of secret schools of occultism and jealously guarded by them. What has filtered through to the public has been rather unsatisfactory and vague, although occult students the world over have recognized their importance. The magical wheel discovered in the thirteenth century by Raymond Lully, which was to solve all problems, was the tarot. In the sixteenth century, William Postel wrote concerning it as, The Genesis of Enoch, in a book entitled, The Key of Things Kept Secret From the Foundation of the World. He believed it antedated the Bible. Count de Gebelin wrote concerning it, and St. Martin studied it. Eliphas Levi wrote his masterpiece, The Dogma and Ritual of Transcendental Magic, from studies of it, and S. L. MacGregor Mathers, Papus, and A. E. Waite have contributed works about it. From this it might be concluded that little is left to be said about the tarot. But unfortunately for the general public the secret schools have had no intention of permitting real knowledge concerning it to escape from their midst. Consequently, much that has been written about the tarot has been, not for the purpose of making clear its real significance, but to reveal what had clandestinely escaped from the secret schools. Even so fearless a writer as Eliphas Levi admits this, and the few mistakes he makes in his own writings are so glaring, and yet so near the truth, that they can be ascribed neither to carelessness nor ignorance. There is no extant ritual, as there can be no doctrine, which contains, or can possibly contain, the secret of mystical procedure or the essence of mystical doctrine. The reason is not because there is, or can reasonably be, any indictable secret, but because the knowledge in question is in the custody of those who have taken effectual measures for its protection; and though from time to time, some secrets of initiation have filtered through printed books into the world at large, the real mysteries have never escaped. There is a secret tradition concerning the tarot, as well as a Secret Doctrine contained therein; I have followed some part of it without exceeding the limits which are drawn about matters of this kind and belong to the Laws of Honor. This tradition has two parts, and as one of them has passed into writing it seems to follow that it may be betrayed at any moment, which will not signify, because the second, as I have intimated has not passed at present and is held by very few indeed. The purveyors of spurious copy and traffickers in stolen goods may take notice of this point, if they please. Men who follow science as a profession have a very different code of honor. The truly scientific man does not hold what he discovers, or what others have discovered, merely to benefit a chosen few. It is the code of science to give whatever information is discovered to the public that not one select clique may have an advantage, but that the whole human race may be the gainer. And it has always seemed to me a colossal piece of selfishness for any group of men, if they really possessed information that might be beneficial to all mankind, to hoard it for themselves alone. I hold, therefore, that secrecy in any matter that will aid the soul in gaining knowledge of its true relations to the universe, or that will assist in making life happier, or the attainment of spirituality easier, is not a virtue. Consequently, departing from the custom of many other writers on this subject, I am introducing no blinds and no subterfuges into these lessons. As to traffickers in stolen goods, what I present, in its essentials, has been in the custody of The Brotherhood of Light for ages. But even were it otherwise, I would not hesitate to present any information that I deem might in some manner assist human progress and happiness, from whatever source it might be gleaned. The time has ceased, I trust, when a few shall possess a monopoly on the truths regarding spiritual things. The reader will find here all that is necessary for him to know about the tarot and its Secret Doctrine to put him on the right path, and he could hope for no more even within the most exclusive circles; for attainment is not vicarious. The original work is exceedingly ancient and rare, is inscribed on palm leaves, and found only in the remotest parts of India and Tartary. It is called, The Atma Bodha, or Book of Soul Knowledge. It is divided into three books, the second being a commentary on the first. The third book contains but seven statements which form a brief summary of the whole subject. The work, translated into English was possessed by members of The Hermetic Brotherhood of Luxor (long since closed), and is fully as lucid in explaining mystical atonement as are the teachings on this subject of any western order. Lack of space prevents the giving of more than the summary, the key to the whole matter; but this meditated upon in connection with the tarot will prove quite sufficient for anyone whose spirituality is such as to permit illumination; which is all that any outside help can give, although the whole work is of utmost value. I. Whatever exists, exists as a Whole, as God, or is a part, or emanation from God. II. In the Whole as an angel, unconscious of the Whole, is an undescended spirit. III. Parted from the Whole, yet a portion of the Whole, and unconscious of the Whole, is the Law of Differentiation. IV. Parted from the Whole, with the Whole, yet external to the Whole, is a descended or fallen spirit. V. Parted from the Whole, with the Whole, yet conscious of the Whole and knowing it has fallen away from, and that it should, and can, return to the Whole, is the Law of Reascension. VI. That which is parted from the Whole, turns again to the Whole, is the Law of True Repentance. Of the plates on which the ancients pictured the facts they ascertained regarding spiritual science and universal law, which have been handed down to us in the form of the tarot cards, 22 are more important than the rest. They correspond to the 12 zodiacal signs and the 10 planets in the chain. And the ideas thus pictorially expressed in universal symbolism later came further to be condensed as conventional and easily written hieroglyphics, and this is the origin of the square-formed letter of the Hebrew and Egyptian alphabets. 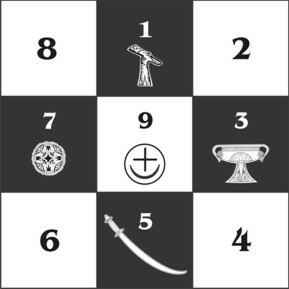 And, because there were no separate characters for numbers, each such square-formed letter also became the number expressing the spiritual idea embodied in the pictured plate. Then to still further express the numerical interaction of forces and ideas between the four kingdoms of fire, earth, air and water; a scale of ten numerals was added, and repeated in association with the emblem of a kingdom, giving a total of 40 additional plates, or suitcards. Each according to its number, of course, corresponds to some astrological subdivision of the original 22 conceptions. All these forces, however, have an influence upon man. He is the point where they come to a focus. But men are not all the same, and this difference in type is best expressed by the sign of the zodiac under which each is born. So we have 12 plates, or cards, picturing people born under each of the zodiacal signs. To express the family relation they are represented as Father, Mother and Son, pictured more commonly as King, Queen and Youth (Jack). The temperaments of these people are further shown by the suits; for the fiery signs of the zodiac represent the sanguine temperament, the watery signs the lymphatic temperament, the earthly signs the bilious temperament, and the airy signs the nervous temperament. Thus the suit denotes the temperament. In addition to cosmic and other influences there is another thing of importance. People have thoughts. They are probably the most potent of all forces. Consequently, it was essential to have them represented. And to show their source of origin they should be associated with people. Therefore, to depict them, the ancients had recourse to a horseman; for the Twins, ruling the house of private thoughts in a natural birth-chart, were often represented on horses; and Sagittarius, ruling the house of publically expressed thought in a natural birth-chart; is a horseman. The complete set of the tarot plates, or cards, therefore consists of 22 Major Arcana, 40 Minor Arcana, and 16 Court Cards; a total of 78. Just why each Major Arcanum is a pictorial representation of the spiritual associations of the planet or zodiacal sign with which it is given will be made plain as we make a study of each. The four members of each suit of court cards represent, in their wider application, the Hebrew name of Deity—Jod-He-Vau-He; signifying masculine, feminine, union, and the product. And they also throw light upon the origin of the Holy Trinity worshiped by Christianity. In Egypt, Osiris the Father, Isis the Mother, and Horus the Issue, were popularly worshiped; and in addition there was a fourth deity which included the three others, and overshadowed them, as do the thoughts of a family, called the Holy Ghost. So when Athenasis came from Egypt to the Holy Council of Nice to assist in settling of what the orthodox Trinity consisted, he introduced the Holy Ghost. Most contemporaneous nations, other than the Egyptians, held merely to the Trinity of Father, Mother and Issue. But the Holy Ghost came to Christianity at an opportune time; for due to the teachings of Paul, and the fanatic asceticism that was developing, it was becoming quite certain that woman could have no part in anything divine. The monks who retired to monastic life looked upon woman as an instrument of evil, a tempting agent of the devil, strictly to be avoided. They characteristically shifted the blame for all the ills of humanity to her shoulders by teaching that the fall of Adam was due to the guile of Eve. So, while the Church still retained the Virgin Isis—which as the sign Virgo, has from time immemorial been pictured as a virgin with a crescent Moon in her arms to symbolize the immaculate conception—as the Mother Mary, and venerated her accordingly; they felt compelled to cut her from the Holy Trinity. In her stead they substituted the Holy Ghost. Yet while cutting woman from the Holy Trinity, they were powerless to efface her from nature; and in the common playing cards as in the tarot, she holds her rightful place as Queen, joint ruler with the King. But the fourth court card, still retained in the tarot, even as the spirit of rectitude and justice which in its wider application it represents, has departed from our midst. As to the emblems by which the four suits are recognized, they were derived as universal symbols from the most important of natural phenomena, the passing of the seasons. Even as heralded in the verses of Omar, the spring is signaled by the rose. In certain older cards the rose is sometimes found. The spring is the period of renewed life, and thus the rose, as representing it, in some mystical orders, is the symbol of a renewed life. Spring brought a new food supply, which nourished life. But this food supply, by which life might be sustained also might be purchased. And thus we have the pieces of money, the coins of the tarot. But in later days a more commercial age decided that for sustaining life through trade, diamonds were even more precious than money. So in modern cards we have the suit of diamonds. The summer brought the trefoil, or three-leaf clover, which was important for forage to the flocks of a pastoral people. So the clover became associated with the heat of summer. A similar heat could be produced with wood. And thus scepters came to be the symbol of summer heat, and are so represented in the tarot. Moderns, however, continue to picture the clover, but refer to the wood still, calling it the suit of clubs. The autumn, when the wine was pressed from the grape, came to be the season of festivities, of dancing and of marriage. To represent the emotions then engendered, the cup, from which the wine was quaffed, came to be used, and thus is still one of the suits of the tarot. But moderns, associating the emotions of joy, and those that result in marriage, with the heart, have preferred to use them in picturing the corresponding suit of playing cards. The winter was a time of dearth and want. To provide for this period when no food could be garnered, it was customary to work hard to gather and hoard a supply sufficient to last through until spring. And it was observed that the oak also thus provided a food supply which was similarly stored by the squirrels. Thus the acorn came to be used as the symbol of winter. But, in time, the afflictions of winter, and the struggle to sustain life, especially as it often led to strife among peoples, came to be depicted by the emblem of strife, the sword. Yet a still later people looked upon the unfruitful season as the cause of their unceasing toil; and to depict this, used the modern emblem of toil, the shovel, or spade as it is called in modern playing cards. Thus the balmy air of spring is represented by coins, the fire of summer by scepters, the bibulous festivities of autumn by cups, and the hardships of winter by swords. 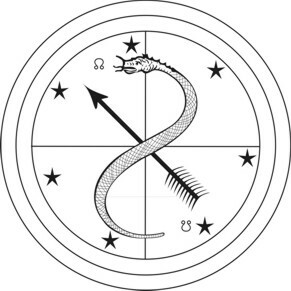 Therefore, we must consider that coins correspond to the airy signs, scepters to the fiery signs, cups to the watery signs, and swords to the earthy signs, of the zodiac. When the unconscious mind has its attention focused on obtaining certain information, the psychic senses are active to obtain that information. And because of the vastly wider scope of their power, due to the properties of inner-plane existence where they function, they are able to acquire information quite inaccessible without their aid. This information then resides in the astral brain as a memory. That is, it is a memory of what has been gathered astrally. The tarot cards afford both a means by which the attention of the soul is directed to acquiring such information, and a means by which this information, which then exists as a memory in the astral brain, can be raised into the region of objective consciousness. One who has experience with the tarot cards will become convinced that there is some power present, not merely that directs how they shall be read, but that actually directs their distribution so that they will give a correct reading. Extra-sensory perception is able to observe their positions in the pack as shuffled. And extra-physical power (now demonstrated in our universities as the Psychokinetic Effect) in cooperation with the unconscious muscular activities of the shuffler, tends to arrange the cards in shuffling, and so to cut the pack, that when dealt they shall fall in positions to give the information desired. Full details of this process are set forth in Chapters 1, 2 and 3 in the Course XI, Divination and Character Reading. The first essential of a reading is that there shall be a strong and unprejudiced desire to know something. If other strong desires or preconceived opinions intrude during the shuffling and reading of the cards, they will warp the reading from the truth. The mind should be concentrated on obtaining a correct answer. While the mind is so occupied, the cards should be shuffled in such a manner as not merely to rearrange them in the deck, but to reverse the ends of some. They should then be cut into three piles and gathered again into a pack. This shuffling and cutting should be repeated three times; and then the cards dealt, face downward. They are turned over from top to bottom, but turned over only one at a time, as read. To answer a question Yes or No, five cards are dealt in a single row, from right to left. The middle card counts 2 and the other cards each count 1. A majority of the counts right end up is an affirmative answer. A majority of the counts wrong way up is a negative answer. If the right way up and the wrong way up are evenly divided, it is a draw, and the answer is undecided. Seven cards dealt in a row in this manner, from right to left, will answer a question briefly, and nine so arranged will give greater detail. The present of the matter is revealed by the middle card. The conditions or events leading up to it are signified by the cards commencing at the right. The cards commencing at the left of the middle and moving to the last one on the left, show the conditions and events pertaining to the matter in the future.